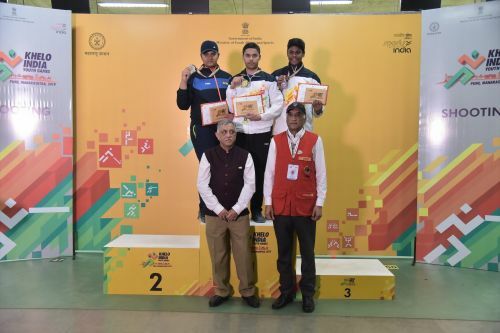 Pune, Jan 14: Chandigarh twins Vijayveer Sidhu and Udhayveer Sidhu were within a fifth of a point, that is 0.2 points, of winning both the gold medals at stake in shooting on Monday in the Khelo India Youth Games today. Coming in the way of that dream was World Junior Championship bronze medallist Arjun Singh Cheema of Punjab, who edged out Vijayveer in the under-21 final by the slenderest of margins. Later Udhayveer won the Under-17 gold comfortably. Later, Udhayveer ran out a winner of the Under-17 final. He made light of qualifying in sixth place and kept challenging leader Rajkanwar Singh, again of Punjab, until he crumbled in the last four shots. The twins, who train with D.S. Chandel in Chandigarh when not at national camps, won a World Junior Championship gold medal each in Changwon last year. Vijayveer’s gold had come in 25m standard pistol and his twin had topped the 25m sport pistol section. At the same event, Arjun Singh Cheema won the 50m free pistol gold. The teenage quartet provided the fireworks in the two finals on a day that started disappointingly with news of the celebrated world junior and Asian Games champion Saurabh Chaudhary (Uttar Pradesh) deciding against competing here.